Any person not being an individual or a HUF who is responsible for paying to a resident by way of fees for professional or technical services royalty and any sum referred to clause (va) of section 28 is liable to deduct tax at source in case aggregate of the amounts of such sums credited or paid or likely to be credited or paid during the financial year by the aforesaid person to the account of, or to the payee exceeds Rs. 20,000/-. This limit of Rs. 20,000/- has been enhanced to Rs. 30,000/- w.e.f. 1.7.2010. This section is applicable with effect from 1.7.1995. Moreover where any such income by way of Professional or Technical services etc. is credited to ‘Suspense Account’ or to any other account shall also be liable to deduct tax at source. Professional Services’ means services rendered by a person in the course of carrying on legal, medical, engineering or architectural profession or the profession of accountancy or technical consultancy or interior decoration or advertising or such other profession as is notified by the Board for the purposes of Section 44AA or of this section. ‘fee for technical services means any consideration (including any lump sum consideration) for the rendering of any managerial, technical or consultancy services (including the provisions of services of technical or other personnel) but does not include consideration for any construction, assembly, mining or like project undertaken by the recipient or consideration which would be income of the recipient chargeable under the head ‘Salaries’. “authorised representative” means a person who represents any other person,on payment of any fee or remuneration, before any Tribunal or authority constituted or appointed by or under any law for the time being in force, but does not include an employee of the person so represented or a person carrying on legal profession or a person carrying on the professional accountancy. ‘company secretary’ means a person who is a member of the Institute of Company Secretaries of India in practice with in in practice within the meaning of sub-section (2) of section 2 of the Company Secretaries Act, 1980. (5) The profession of Sports. Individuals and H.U.F. covered by section 44AB need not deduct tax at source on payment for Professional services in case such sum is credited or paid exclusively for personal purposes of such individual or any member of Hindu Undivided Family. [3rd Proviso to section 194J(1) w.e.f. 1.6.2003]. Payment for Advertising have been covered under section 194C as well as u/s 194J . In this connection C.B.D.T. has clarified that section 194C will apply to payments made to the advertising agency in connection with services rendered by such agency in the area of advertising. When payments are made by advertising agency to professionals engaged by such agency in connection with the execution of advertising jobs, the payments to these professionals e.g. film artist, an actor, a cameraman etc. would attract the provisions of section 194J. It was further clarified that any payment is liable for tax deduction only under one section. (b) Fees for Technical Services. as and when the aggregate of the amounts of such credited or paid or likely to be credited or paid during the financial year exceeds Rs. 30,000/-. Individuals or HUFs who are subject to tax tax audit under Section 44AB during the financial year immediately preceding the financial year in which such sum by way of fees for Professional or Technical Services is paid or credited shall also be liable to deduct tax at source. However if the payment by such individuals and/or H.U.F. is for personal purposes of such individual or any member of the family no deduction of tax is required to be made. At the time of credit of such sum to the account of the payee or at the time of payment thereof in cash/ cheque etc. whichever is earlier. This rate of 10% has been amended from 5% w.e.f. 1.8.2007. Remuneration/payments to a Director other than in the nature of Salary shall be liable to deduct tax at source @10% u/s 194J (w.e.f. 1.7.2012).Cut off limit of Rs 30000/- is not applicable. (1) Payments to hospital liable to TDS Payments to a hospital for rendering medical services liable to TDS u/s 194J. (2) Payments to an electrician attracts the provisions of section 194C Payments to an electrician or to a contractor who provides services of an electrician will be in the nature of payment made in pursuance of a contract for carrying out any work, and therefore attract the provision of section 194C. (3) Payments by advertisement agency to certain professionals When an advertising agency makes payments to a film artist such as cameraman etc., tax will be deducted at source. 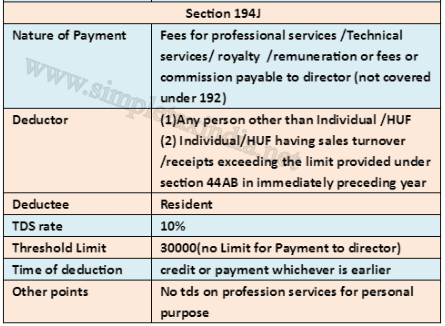 (5) TDS on service tax on professional services fees under section 194 -1 is applicable. GOOD. PL CLARIFY WHETHER TDS IS TO BE DEDUCTED BY AN EDUCATIONAL INSTITUTION WHILE PAYING REMUNERATION TO A VISITING PROFESSOR WHO IS NOT ITS EMPLOYEE? In my view tds is deductible u/s 194J if honorarium is more than cut off amount given in the section. is there any section in 194 j in which it is stated that there should be any kind of tax deduction for contractul teacher's working in schools. If contractual teacher is working as an employee then it is covered under 192 otherwise in 194J . sir my relative is working as contractual teacher in kendriya vidyalaya and income tax officer send a letter to deduct the tds as per 194j. Sir is there any kind of tds deduction for those contractual teachers or not? If yes then what is its limit ? TDS deduction is responsibility of school not your relative. Further to check whether your relative is covered under 194J or 192(salary) we have top check contract with school. If contract is for employment at fixed rate then tds u/s 192 is applicable. If contact is for providing services than tds u/s 194J applicable. my friend is a retainer with a company and the company pays him a fixed sum monthly (after deducting 10% as tax) as retainer fee for professional services. He incurs substantial expenses on employing a computer operator and chauffeur (both of which are required for carrying out his professional services). How can he claim rebate in tax because on account of these expenses ? Also please guide as to what are the formats acceptable as proof of payment to computer operator and chauffeur ? You can deduct exp. which has been incurred to earn professional income . For computer operator an driver salary ,take monthly receipt of salary from them . Pay through cheque if possible.Further you can claim stationary , computer labtop depreciation , internet exp. , telephone etc etc . keep bills intact with you .Where not available take payment receipt from receiver ....Prepare books of Accounts and claim all such exp. I am working abroad but getting some payment in India as cosultation fee. Is this ammount is liable to for TDS. And what is this 30000 cutoff, is that in a FY if all amount exceed than 30000 then TDS will be deducted. I am working abroad and getting some payment in india, is this amount is also liable for TDS. And what is cutoff 30000 means..
i have received the form16A from my employer. the total TDS deducted is Rs.38700. i filled the return for the same. now i got the mail from incometax dept that the amount Rs38700 has not been received by them , instead they have received Rs. 32000. so there is a mismatch of Rs.6000. pls let me know how to rectify this problem?? thanks. Is it TDS is applicable on Invoice raised as "Charges towards Website Designing". If TDS is applicable than what's the section & what's the rate of TDS deduction. I have one doubt. Our company pays statutory clearance charge (charges towards handling filing all excise document with dept)to an individual who is not a professional. Does it attract TDS. If so at what rate. we are a company, we received invoice from a vendor for his service of Email server hosted mail box usage charges. In which section we need to deduct the tax and reason for it? A person who is a freelance copy editor, that is to say he/she receives files in word or any other format, has to go through the same as a proof reader and make corrections as required and return to sender. Would this be a contract or professional service? Please clarify. Thanks in advance. I am working for a production house as a business development person.I'm being paid 15000 pm, on professional basis, on which 10% TDS is cut. Please guide me, as to how I can avoid this, or reduce it or reclaim it if possible? I am new to this. So pls explain in lay man's terms. You can get refund by filing the income tax return on itr-4 ,download itr-4 and get it filed through profession help and file it to income tax department. I am an IT engineer got TDS deducted from my Traning Period Honararium under 194Jfor which i have filed ITR 4 in which i have shown only income and TDS deducted while other fields have not filled and this Form i submitted as books maintained... so whether i am on right path or i did a mistake???? so whether under books not mained is proper??? if i do so then do i need to fill all the fields then ???? thanks a tonn sir .......... sir will you guide me further more as m trying to have command on income tax as m practicing as tax practitioner but having command on MVAT only having basic knowledge of IT but i want detailed knowledge.. If the company has deducted tax which i hadnt claimed by filling return then what is the solution?? if there is no any deduction of tax but i m having other deductions like group insurance and medi claim then what should i do?? Which ITR i should file and how can i file return for last 3 years including current year?? In case my TDS is deducted and there is a refund in last years then how can i claim this now?? can i claim this or not?? What was your Income for last three years and what amount of tax deducted each year provide details . Further in last two year return up to salary income of 500000 is not required to be filed . but the bank is demanding three returns of Income tax then what should i do??? okey thanks .... one more question what if i have refund in AY 11-12 and 12-13 then can i claim this now??? if yes then how?? You can file ay 12-13 return only (including refund) up to 31.03.2014 . I am working as a credit officer in the bank where i get salary around of Rs. 8000/- per month i have deduction of Provident Fund only and investment in shares so which ITR i need to file? and whether the deduction of investment in shares is available unders any provision?? Tds must have been deducted at the time of credit given to professional , please inform your status like individual or partnership firm and turnover , whether you covered under audit case etc . i was working on contract as teacher in training institute with salary Rs.4000/- pm. I worked for 12 months and by totalling varing amounts i got in this 12 months is approx. Rs.42,000/- . I left the job on 31 Jan 14 . now 2 days back i got call from institute saying they need my pan card number and as my payment is above 30,000 so i have to pay TDS 10% = 3100 rupees. I am not having any idea about this.hope i will get an answer from you how this thing is calculated. i have already left my job 2 months back so still i have to pay them? What if TDS was not deducted as per professional service from a training institute? what if tds was not cut according to professional services rule from an education institute? I am a self employed professional. I pay a salary of rs 8000 per month to my driver.. do I need to deduct TDS from his salary. How to maintain record of the payment made??? driver is your employee and covered under tds section 192 (salary)his income is less than 250000(Basic exemption limit ) so no tds is required to be deducted. Further you should get a receipt of payment from your driver and if possible make payment through cheque where ever possible. Is TDS to be deducted payment basis or due basis? Will be TDS be applicable on AMC and subscription charge like that of tally and annual subscription to an association? kindly clari fy the provision of tds us194j of professinal fees. We are company and our 2 consulatant of one is CA and oher is Advocate and both professional charges is RS 19000 & 21000.so we deduct tds or not? which limit i checked it ? If we are making payment of professional fee to 2 doctors 20000 each. Wheather tds will be dudcted or not??? Firstly if you are paying it in personal capacity then no need to deduct TDS ,irrespective to amount .